Expression of transgene-encoded proteins in the pancreatic islets can cause peripheral deletion of T cells. However, tolerance has not been observed in all transgenic models. It has been proposed that the determining factor for successful peripheral tolerance is the amount of Ag cross-presented by quiescent APCs. Using InsHA mice, which demonstrate peripheral tolerance to the influenza virus hemagglutinin (HA) expressed in the pancreatic islet β cells, we have investigated the consequences when different amounts of HA are expressed. As compared with InsHA mice that are heterozygous for the InsHA transgene, homozygous InsHA mice demonstrated enhanced activation and proliferation of Kd-restricted HA-specific CD8+ T cells in the pancreatic lymph nodes. However, despite such activation, insulitis was not observed, and the T cells were gradually functionally deleted. Deletion of these activated cells occurred much more rapidly in homozygous than in heterozygous InsHA mice. These data demonstrate that there is a direct correlation between the amount of HA expressed in the periphery, and both the degree of T cell proliferation in the pancreatic lymph nodes and the rate of tolerance of HA-specific CD8+ T cells. This strongly supports the hypothesis that activation of T cells through cross-presentation of peripheral Ags in a noninflammatory environment is an important part of the normal mechanism of tolerance to Ags expressed in the pancreatic islets. Tcell tolerance to most self-Ags occurs during thymic development (1, 2, 3). However, as not all tissue-specific protein Ags are expressed in the thymic milieu, other mechanisms must exist to prevent autoimmunity to Ags encountered in the periphery. One strategy that has been used to study mechanisms of tolerance to Ags expressed in peripheral tissues has been to target expression of transgene products using tissue-specific promoters. This has been done extensively with the insulin promoter (4, 5, 6, 7, 8, 9, 10, 11, 12, 13, 14), and studies using TCR transgenic T cells specific for Ags expressed by islet β cells have revealed the existence of a mechanism of tolerance that relies upon cross-presentation of β cell-specific protein by professional APC (7, 14, 15). Naïve T cells become exposed to such peripherally expressed Ags as they circulate through the pancreatic lymph nodes. Surprisingly, despite the fact that the Ag is presented on professional APC, this interaction results in an abortive activation of the T cells, resulting in their clonal elimination (7, 14). This type of elimination has been observed previously in two transgenic models in which Ags are expressed under the control of the rat insulin promoter (RIP),3 one involving CD4+ T cells specific for the SV40 T Ag cells (14), and the other involving CD8+ T cells specific for OVA (RIP-OVA mice) (7). Nevertheless, not all mice that express transgenic proteins in their islets demonstrate clonal elimination and tolerance. Mice that express the lymphocytic choriomeningitis virus (LCMV)-encoded glycoprotein (GP) do not develop spontaneous diabetes, yet they harbor GP-specific T cells that can be activated following infection with LCMV to cause autoimmune destruction of the β cells (10). This phenotype has been referred to as “ignorance,” as the naive T cells ignore cognate Ag present on the β cells. Recent studies have suggested that ignorance may occur when the level of expression and/or cross-presentation of Ag is insufficient to lead to activation of naïve T cells in the draining lymph nodes (16, 17). By extrapolation, this suggests that the extent of tolerance to self-proteins may vary significantly depending upon the amount of cross-presented Ag that is made available in the draining nodes. InsHA mice express the hemagglutinin (HA) protein from influenza virus A/PR/8 H1N1 under the control of the RIP (4). These InsHA mice demonstrate tolerance of the transgenic product, which occurs as a result of expression of HA by pancreatic islet β cells. Previous studies showed that clone-4 TCR transgenic CD8+ T cells, specific for the dominant KdHA epitope (18), demonstrate activation and proliferation in the draining lymph nodes of the pancreas, but not in other lymphoid tissues (15). In this report, we demonstrate that the consequence of such activation is functional deletion of clone-4 TCR transgenic CD8+ T cells, which occurs in the absence of insulitis or diabetes. Furthermore, it is shown that the rate of peripheral activation and subsequent tolerance is a function of the amount of Ag expressed by the β cells, as well as the number of HA-specific T cells. BALB/c mice were purchased from the breeding colony of The Scripps Research Institute (TSRI, La Jolla, CA). InsHA transgenic mice (4) and clone-4 TCR transgenic mice (18) were generated and characterized as previously described and each line backcrossed at least eight generations with BALB/c. Clone-4 TCR mice were also backcrossed with Thy1.1+/+, BALB/c for two generations to achieve homozygosity for Thy1.1. All mice were bred and maintained under specific pathogen-free conditions in TSRI vivarium. All experimental procedures were conducted in strict accordance with the guidelines laid out in the National Institutes of Health Guide for the Care and Use of Laboratory Animals. Influenza virus A/PR/8/34 H1N1 was grown in the allantoic cavity of 10- to 11-day-old hen’s eggs. Following isolation, the allantoic fluid was titered for hemagglutination using chicken RBC and later stored in 1-ml aliquots at −70°C. Mice were immunized i.p. with 1200 HA units of PR8 in the form of allantoic fluid. A single cell suspension was prepared from the lymph node cells of Thy1.1+/+ clone-4 TCR mice. Purified naïve CD8+ clone-4 TCR cells were prepared by first passing 108 clone-4 TCR lymph node cells through a nylon wool column (Wako Chemicals, Richmond, VA) that was presoaked for 1 h at 37°C in RPMI 1640 medium containing 10% v/v FCS, 25 mM HEPES, 2 mM glutamine, 5 × 10−5 M β-mercapto-ethanol, and 50 mg/ml gentamicin (complete RPMI). After 1 h, cells were eluted from the nylon wool column with 15 ml of complete RPMI and centrifuged. The pelleted cells were resuspended in 1 ml of anti-heat stable Ag (J11D), anti-CD4 (RL172), and anti-MHC class II (CA4/A12) Ab supernatants per 107 cells, and the mixture was incubated on ice for 1 h. Cells were then centrifuged, the Ab discarded, and then resuspended in Low-Tox rabbit complement (Accurate Chemical and Scientific, Westbury, NY) and incubated for an additional 1 h at 37°C. Cells were then washed three times in complete RPMI. The purity of CD8+ cells was determined by FACS analyses. A total of 1 × 106 cells were incubated for 20 min on ice with FITC-conjugated and PE-conjugated Abs against mouse CD8 and CD4, respectively (PharMingen, San Diego, CA.). After washing three times in HBSS containing 0.1% w/v BSA (Sigma, St. Louis, MO.) and 0.02% w/v sodium azide, cells were analyzed with a FACScan and CELLQuest software (Becton Dickinson, Mountain View, CA). The purity of CD8+ cells was found to be >85% in all cases. Purified CD8+ cells demonstrated a naive phenotype as evidenced by CD62Lhigh, CD44low, and CD69 negative staining with FITC-conjugate Abs against each molecule (PharMingen). Purified clone-4 TCR CD8+ T cells were resuspended at 5 × 107 cells/ml in PBS. A total of 2 μl of a 5-mM solution of 5,6-carboxy-succinimidyl-fluorescein-ester (CSFE; Molecular Probes, Eugene, OR) in DMSO (Sigma) was added per ml of cells and incubated for 1 h at 37°C. Cells were washed once in cold PBS and then resuspended at 2.5 × 107 cells/ml of complete RPMI. All manipulations with CSFE were conducted in such a way as to minimize exposure to light. Recipient mice were injected i.v. with the indicated number of CSFE-labeled clone-4 TCR CD8+ T cells in 200 μl of PBS. The presence of these cells in the peripheral lymphoid organs of recipient mice was determined 3 days later by FACS analyses. CSFE-labeled clone-4 TCR CD8+ T cells were detected by incubating with PE- conjugated anti-CD8 Abs (PharMingen). Thy1.1+/+ clone-4 TCR CD8+ were detected by incubating with PE-conjugated anti-Thy1.1+/+ Ab (PharMingen) in combination with one of the following: CyChrome-conjugated anti-Vβ8 (F23.1), CyChrome-conjugated anti-CD4, plus FITC-conjugated anti-CD8 Abs (PharMingen). Pancreata were excised and passed through a nytex mesh to produce a cell suspension. Cells were washed in complete RPMI and resuspended in 5 ml of complete RPMI containing 2 U/ml of collagenase (Boehringer Mannheim, Indianapolis, IN) and then placed in a shaker at 37°C for 10 min to separate the islets from the parenchymal tissue. Islets were collected and incubated with collagenase for an additional 1 h in a shaker at 37°C to disaggregate the islets into a single cell suspension. The disaggregated β cell suspension was washed three times in complete RPMI and then resuspended at 2 × 107 cells/ml of the FITC-conjugated anti-HA 37/38 Ab for FACS analyses to determine the level of HA expression. 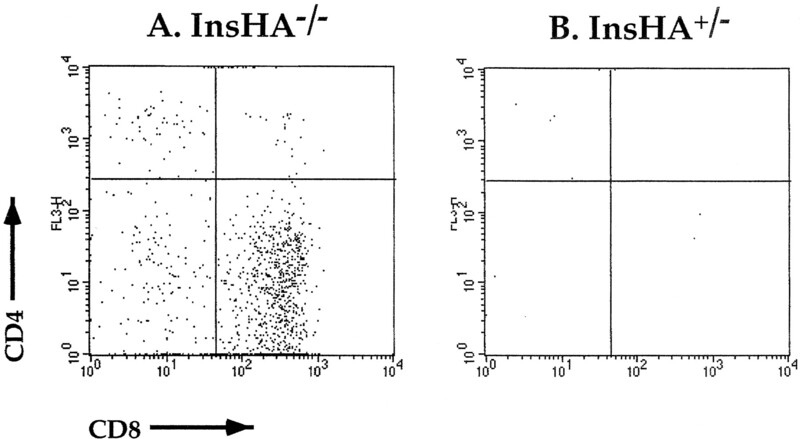 To compare the amount of HA expressed in the islets of InsHA mice that were either homozygous (InsHA+/+) or heterozygous (InsHA+/−) for the InsHA transgene, pancreatic islet cells were prepared from InsHA+/+, InsHA+/−, and conventional BALB/c (InsHA−/−) mice and were incubated with a mAb specific for HA. The level of HA observed was consistent with a linear relationship between gene dosage and protein expression (Fig. 1⇓). FACS analyses to determine HA expression by islet cells from InsHA mice. Purified islet cells from InsHA−/− (shaded area), InsHA+/− (——), and InsHA+/+ (- - - -) mice were stained with the FITC-conjugated, 37/38 anti-HA mAb. 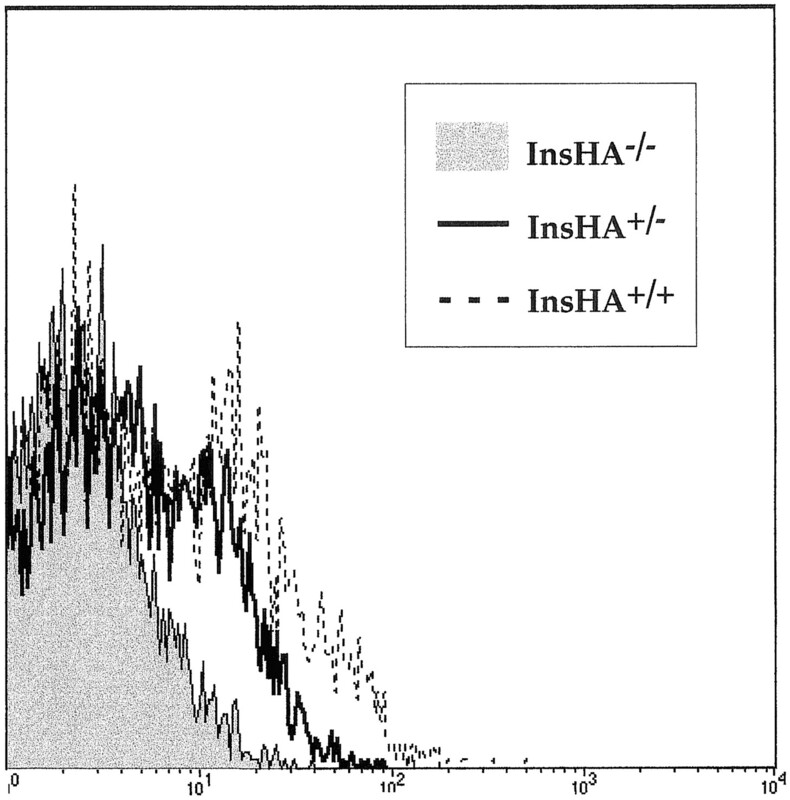 Mean fluorescence values are as follows: InsHA−/−, 2.8; InsHA+/−, 17.4; and InsHA+/+, 37.6. To determine how the amount of HA expression affected the level of presentation of KdHA epitope in the pancreatic lymph nodes, we examined the degree of activation of naive KdHA-specific clone-4 TCR CD8+ T cells in the periphery of InsHA mice. Specifically, purified CSFE-labeled clone-4 TCR CD8+ T cells were transferred into InsHA−/−, InsHA+/−, and InsHA+/+ recipients (Fig. 2⇓). Using this internal fluorescent label, cell division is indicated by the appearance of daughter cells that contain half the fluorescent label of their progenitors (15, 19). Following transfer into InsHA+/− mice, purified naive Thy1.1+ clone-4 TCR CD8+ T cells underwent several rounds of division in the draining lymph nodes of the pancreas, as evidenced by the series of fluorescent peaks observed in the FACS profile (Fig. 2⇓B). This activation does not occur in other peripheral lymphoid tissue (15). However, in InsHA+/+ mice, the majority of the CSFE-labeled cells divided (Fig. 2⇓C), indicating that activation was significantly more efficient in these mice. The fact that the proportion of cells that have not divided appears to be >2-fold in the InsHA+/− than in the InsHA+/+ mice suggests that the activation of the clone-4 TCR CD8+ cells is dependent upon a threshold dose of KdHA epitope, which is limiting in InsHA+/− mice (20). CSFE-labeled purified naïve clone-4 TCR CD8+ T cells demonstrate greater proliferation in InsHA+/+ than InsHA+/− mice. Groups of four adult InsHA−/− (A), InsHA+/− (B), and InsHA+/+ (C) mice were injected i.v. with 5 × 106 CSFE-labeled purified clone-4 TCR CD8+ T cells. Then, 72 h later, cells were isolated from the pancreatic lymph nodes and stained with PE-conjugated anti-CD8 Abs. Data shows the expression of CSFE among activated CD8+ T cells obtained from pooled lymph nodes. For clarity of depiction, the unlabeled cells have been deleted from the histograms. It was previously demonstrated in mice that expressed either OVA (7) or SV40 T Ag (14) in their pancreatic islets, that cross-presentation of islet Ags in the draining lymph nodes of the pancreas could ultimately lead to deletion of potentially autoreactive T cells. However, in these studies, such activation also led to insulitis and diabetes. As there was no evidence of diabetes in any InsHA mice that received clone-4 TCR CD8+ T cells, it was of interest to determine whether, following activation in the pancreatic lymph nodes, the clone-4 TCR CD8+ T cells proceeded to invade the islets. Analyses of sections of pancreatic tissue using fluorescence microscopy revealed that CSFE-labeled cells were not present in the islets or surrounding parenchymal tissue of pancreata taken from either InsHA+/− or InsHA+/+ recipients 3 or 7 days following adoptive transfer (data not shown). However, due to the fact that CSFE intensity decreases with increasing cell division, any infiltrating clone-4 TCR CD8+ T cells may have lost CSFE. Thus, sections of pancreatic tissue taken 7 days after adoptive transfer of 5 × 106 clone-4 TCR CD8+ T cells into InsHA+/+, InsHA+/−, and InsHA−/− (BALB/c) mice, were stained for both CD8 and insulin expression. Examination of tissue gave no evidence of CD8+ T cell-mediated insulitis or islet β cell destruction, as evidenced by uniform insulin expression throughout the islets of all recipients (data not shown). Thus, in both InsHA+/− and Ins-HA+/+ mice, activation and proliferation of naïve T cells in the pancreatic lymph nodes does not result in autoimmunity. It has been demonstrated that, in the absence of T cell help or a proinflammatory signal, naïve T cells that are activated through cross-presentation in vivo can become deleted (7, 14). To determine whether activation and proliferation of potentially autoreactive T cells in the pancreatic lymph nodes of InsHA mice resulted in tolerance, the following experiment was performed. Purified naïve clone-4 TCR CD8+ T cells (1 × 104) were adoptively transferred into InsHA +/+, InsHA +/−, and InsHA−/− (BALB/c) mice. At various time points following adoptive transfer, mice were immunized with influenza virus (PR8), and blood glucose levels were monitored. In preliminary studies, it was determined that transfer of as few as 100 naïve CD8+ T cells from clone-4 TCR mice, followed immediately by PR8 infection caused diabetes. Therefore, the majority of the adoptively transferred cells would need to be functionally eliminated in order for mice to avoid diabetes. As shown in Table I⇓, by 10 days after cell transfer, these KdHA-specific T cells could no longer be activated to cause diabetes in InsHA+/+ mice, although sufficient numbers of functional clone-4 TCR CD8+ T cells persisted to cause disease in the InsHA+/− mice. This indicated that the rate of functional elimination of the KdHA-specific T cells was greater in mice expressing more HA. In addition to availability of Ag for T cell activation, another factor that is likely to determine how long it takes for tolerance to occur is the number of KdHA-specific T cells that are present. Given that a small number of activated KdHA-specific T cells is sufficient to cause diabetes, it would be necessary to eliminate a higher percentage of the initial Ag-specific population to achieve tolerance in mice receiving greater numbers of cells. To determine how long it takes for the InsHA+/− mice to functionally eliminate clone-4 TCR CD8+ T cells, mice were immunized with PR8 at various time points after receiving different numbers of cells. As described in Table II⇓, if mice received 102 cells, tolerance occurred in <5 days. Between 2 wk and 1 mo was necessary to achieve tolerance of 103 cells. However, it took >4 mo for 104 cells to be tolerized. These results suggest that a linear relationship exists between the number of cells injected and the time taken for tolerance (Table III⇓). To determine whether the elimination of functional clone-4 TCR CD8+ T cells was attributable to the presence of HA rather than normal T cell turnover, FACS analyses were used to look for the presence of Thy1.1+, CD8+ T cells in recipient mice immunized with PR8 7 mo after adoptive transfer of 104 purified naïve Thy1.1+ clone-4 TCR CD8+ T cells. Whereas Thy1.1+, CD8+ T cells were not observed in InsHA+/− mice, in the absence of the InsHA transgene, Thy1.1+ CD8+ T cells were readily retrieved from control InsHA−/− recipients (Fig. 3⇓). Thus, functional deletion of Thy1.1+ clone-4 TCR CD8+ T cells was dependent upon the presence of the InsHA transgene. Functional deletion of clone-4 TCR CD8+ T cells is dependent upon the presence of the InsHA transgene. Groups of InsHA−/− (A) and InsHA+/− (B) mice were injected i.v. with 104 purified Thy1.1+ clone-4 TCR CD8+ T cells. Then, 7 mo following transfer, four mice were immunized with 1200 HA U of influenza virus A/PR/8. Fourteen days later, peripheral lymph nodes and spleen were removed, and a mixture of these cells were stained with PE-conjugated anti-Thy1.1, FITC-conjugated anti-CD8 and CyChrome-conjugated anti-CD4 Abs. Data shows CD4 vs CD8 expression among Thy1.1+ cells. Previous studies have proposed that T cell activation and proliferation to islet Ags, cross-presented by APC in the pancreatic lymph nodes, is a mechanism that is normally used to achieve tolerance (7, 14). Nevertheless, there are several reasons why it has been difficult to extrapolate from these studies that peripheral tolerance to islet-expressed Ags naturally occurs by this mechanism. First, in the RIP-OVA model, CD8+ T cells that recognize β cell-expressed OVA were deleted in the thymus due to low-level aberrant expression of OVA in this organ. Therefore, peripheral tolerance does not actually occur in these mice (6). Second, although β cell-expressed OVA was recognized by adoptively transferred OVA-specific T cells via cross-presentation on professional APC, the consequence of subsequent CD8+ T cell activation and proliferation was insulitis and diabetes, rather than tolerance. The fact that significant damage to the islet β cells could occur before the T cells were eliminated makes this a potentially dangerous mechanism for peripheral tolerance in these mice. Indeed, to circumvent the problem of autoimmunity, the authors constructed allogeneic bone marrow chimeras to prevent CD8+ T cell recognition of OVA expressed by islet β cells (7). Unlike the RIP-OVA model, in the InsHA mice, tolerance to the HA protein normally occurs in the periphery, rather than the thymus (4, 15). Following transfer into InsHA mice, naïve KdHA-specific clone-4-TCR CD8+ T cells become activated and proliferate in the pancreatic lymph nodes; however, this does not result in insulitis or diabetes, and these cells are subsequently functionally eliminated over a period of time. Moreover, the rate of elimination is proportional to the amount of activation observed in the pancreatic lymph nodes. Taken together, these results provide compelling evidence that activation of CD8+ T cells in the pancreatic lymph nodes is a precursor of peripheral tolerance. The rate of tolerance observed in InsHA+/+ mice is significantly greater than the InsHA+/− animals. Nevertheless, it is likely that the rate observed in the InsHA+/− mice is more than adequate to allow for immediate tolerance of islet Ag-specific T cells that exit the thymus. It has been estimated that, at the time of greatest thymic output, ∼2 × 105 T cells enter the periphery each day (21). If it is assumed that a normal T cell repertoire contains <1 in 5 × 104 CTL precursors that are specific for an antigenic peptide of the influenza virus A/PR/8 (22, 23), fewer than four KdHA-specific T cells would need to be tolerized each day. Although not directly demonstrated in the current studies, it is highly likely that the HA epitopes expressed by islet β cells in the InsHA mice become available to T cells in the pancreatic lymph nodes through cross-presentation on APC, rather than direct recognition of β cells, as recently described in the RIP-OVA mice (6, 7). The reasons for this are as follows. First, clone-4 TCR CD8+ T cells cannot be detected in the islets or indeed anywhere in the pancreas of InsHA mice. This is consistent with the known trafficking pattern of naive T cells, which are unable to gain access to peripheral tissues (24, 25, 26). Second, naïve T cells are known to require presentation by a professional APC, presumably a dendritic cell, to become activated (27, 28, 29, 30, 31, 32, 33). This is even true for islet-expressed alloantigens, which are unable to stimulate naïve T cells (34, 35). Finally, activated clone-4 TCR CD8+ T cells could only be detected in the lymph nodes that drain the pancreas and not in other peripheral lymphoid tissue (15). The question remains as to why, unlike the RIP-OVA transgenic model, insulitis does not occur in the InsHA mice following transfer of naïve clone-4-TCR CD8+ T cells. The answer may relate to the fact that KdHA epitope is only available to T cells that enter the pancreatic lymph nodes. In the RIP-OVA mice, there is also expression of OVA by the renal proximal tubular cells of the kidney, as well as the pancreatic islet β cells. This additional site of high-level Ag expression may result in the activation and sustained proliferation of greater numbers of CD8+ T cells, resulting in islet access and the destruction of β cells. Such a potentially dangerous situation is avoided in RIP-OVA mice, as potentially autoreactive OVA-specific CD8+ T cells are deleted in the thymus (6). In conclusion, our results suggest that the details regarding the site of expression and amount of expression are determinative of the mechanism used for tolerance. Together, with the results of others, it may be concluded that there are many strategies that are used to avoid autoimmunity, and that peripheral tolerance is one among an arsenal of tools. Peripheral tolerance is of primary significance for Ags that are expressed uniquely in the pancreas and presented in sufficient quantity to achieve activation of naïve T cells. This may fit the profile of availability for a number of different islet-expressed Ags. We thank Ms. Patricia Krier for secretarial assistance. ↵1 This work was supported by Grants AI 39664, DK/CA50824, and CA57855 from the National Institutes of Health and the Juvenile Diabetes Foundation. D.M. is the recipient of a senior fellowship from the Juvenile Diabetes Foundation. ↵3 Abbreviations used in this paper: RIP, rat insulin promoter; HA, hemagglutinin; CSFE, 5,6-carboxy-succinimidyl-fluorescein-ester.